Is 2154 so much different than 2015? Los Angeles (and what can be assumed the whole Earth) in the year 2154 is no man’s land. The City of Angels is dilapidated, grime-infested, crime-infested, and overpopulated beyond capacity. Its inhabitants are on one end of the spectrum, while the extremely wealthy are on the opposite end. They live on a man-made, not exactly secure but hard-to-get-to station in space called Elysium, where all of society’s physical, mental, and environmental ills are not to be found. Max da Costa (Matt Damon) is on the low end of the spectrum, a guy who has desired his whole life to “get up there.” However, when he becomes exposed to a life-altering event, his desire becomes a need. Getting to Elysium will not be a smooth flight though, with Secretary of Defense Delacourt (Jodie Foster) and sleeper agent Kruger (Sharlto Copley) doing everything in their power and outside of it to keep the unwanted out of their haven. If successful, Max will not only improve his live, but unbeknownst to him, the lives of others. 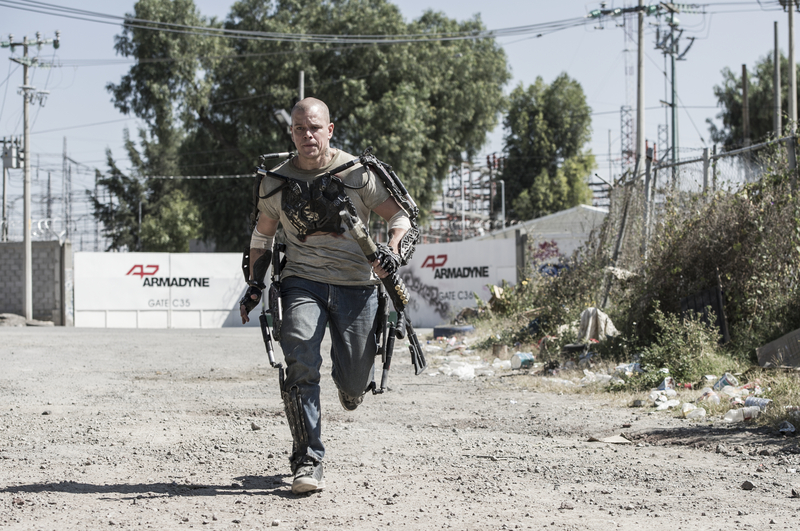 To director Neill Blomkamp, Elysium isn’t a foreshadowing of the future like some science fictions are. As stated by the man behind District 9, “This [Elysium] is today. This is now.” And it really is evident from the get-go that Blomkamp has much to say about health care, immigration, class warfare, and other current hot-topics. It is nice to see a filmmaker with pronounced opinions not be afraid to place them in this films. Now, whether his opinions are overly heavy-handed or not will be up to the viewer. It may be best to look at Blomkamp’s second offering, similar in many places from a plot perspective as his first feature, as more of a hybrid action sci-fi than a truly cerebral one. Not to discredit the commentary here because things are being said and inspire thought, but if compared to D9, and yours truly hates doing this (but the movies are in the same genre), the societal aspects found here are not handled as deftly. With all of that said, this is still an very entertaining flick, and it starts with the world that is featured in it. Blomkamp knows how to craft a setting to the intended effect. Earth in particular is introduced in the first five seconds as a cratered, miserable, and overall unhealthy place to reside on. Contrast that, also established within seconds, to the Elysium space station, which is so beautiful and eye-popping in a synthetic way. With the movie named Elysium however, it is disappointing that little is examined as to how everyday life is on it, how it operates, etc. It is one of those movies that easily could have used an extra 10-20 minutes to expound upon this intriguing focal point. While it may have somewhat of a slower initial pace in a mostly successful attempt to build its setting and characters, the action rises to the forefront when the time calls, and Blomkamp seems to relish in it, from Halo-like force fields to high-powered exoskeletons. None of the set pieces are truly large scale in nature, but they all carry a high level of importance. And, it doesn’t hurt that they look splendid in their presentation. The unstable, shaky, sometimes slo-mo camera effects are slightly disorienting early on in “normal” scenes, but actually add to the action and gives it a pronounced flair as the movie goes on. Having good-looking action is one things, but the right people are needed to make it look cool and believable. Matt Damon has proven his badass hero capabilities before, and does so again here. The role is basically the antihero in it for himself first and foremost, but his plight is one to see through towards the end. In a smaller role, William Fichtner is effective as businessman John Carlyle, snarky and overt in his disdain for Earth and its residents. 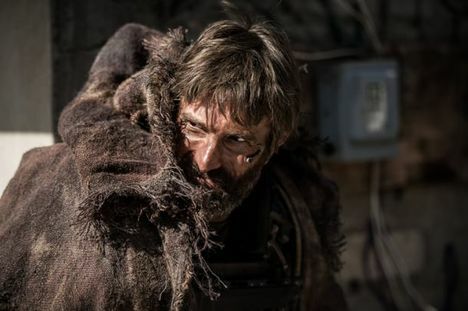 But the real standout is Sharlto Copley as the completely unhinged and remorseless Agent Kruger, in a complete 180 from his character of Wikus from D9. From the moment he reveals his face cloaked under a grungy brown hoodie, you just know that this individual does not need to be around people. For some, he may be a little over-the-top, but for yours truly Copley brings a load of menace and unpredictability along with some occasional laughs. Not all is solid on the acting front. In a true shocker, Jodie Foster turns in a downright shockingly odd performance, putting it nicely. It is just hard to get a feel for what she is going for here as Secretary Delacourt, and the apparent audio dubbing and comically stiff delivery only make things worse. At least she makes a mark on this, which cannot be said for Alice Braga, playing Max’s friend/love interest as Frey. The “/” is intentional; while it can be inferred that the two maybe had something romantic at some point in the past, their relationship isn’t clear and ends up dulling the intended emotional moments. Whatever status is had between the pair, little chemistry exists between Damon and Braga. For as little time as he is on screen, Diego Luna character possesses a stronger bond with Max than Frey does. 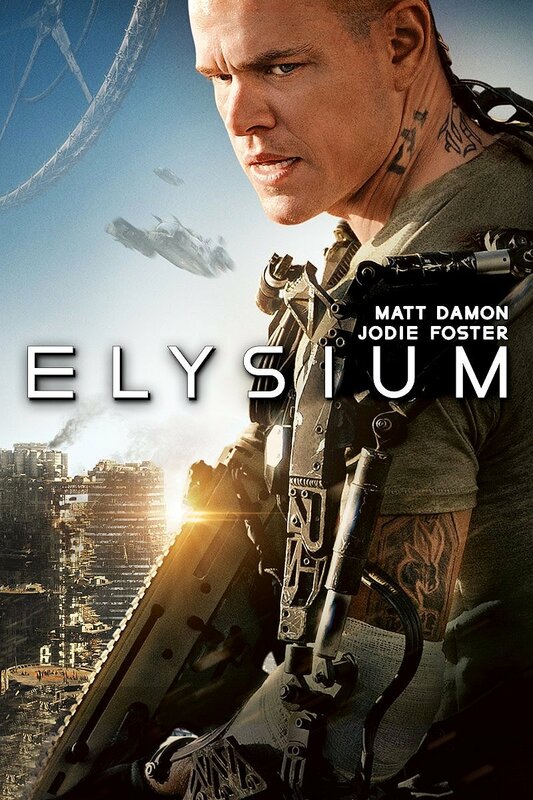 Elysium may lack the touch and “bite” found in classic science fictions, but there still lies a world and a story here that is worth spending time with. And in Blomkamp’s eyes, we are already doing so. Photo credits go to ign.com, rottentomatoes.com, aceshowbiz.com, and wearemoviegeeks.com. I avoided this for a rather shallow reason – I’ve never been a fan of Damon. The only film I can think of that I like and has him in it is Rounders, with Ed Norton. And True Grit. Reading this though I think I should give it a shot. The social commentary angled that you alluded to is what interests me most, I’m always intruiged to see that in a sci-fi movie, though some films definetely do it better than others (Divergent was one of the worst examples in my mind). I know everyone has actors they don’t enjoy but I find Damon usually pretty good and reliable. If sci-fi is your thing, I do recommend. This doesn’t reach amazing levels, but it is entertaining and thought provoking even if it is lacking in touch. I reckon I’ll give it a shot. I haven’t actually seen District 9 so I should get in on what people are talking about. And after watching True Grit not long ago I don’t mind Damon at all, and am not sure why I didn’t like him to begin with!! We are in agreement on Jodie Foster. She is shockingly bad. She speaks and behaves so mechanically, I was sure she would be unmasked as s robot by the end. No such luck. Do you think that Blomkamp was looking for this out of her when shooting, and then when he saw this in post-production he was floored and had to salvage it? The dubbing would seem to indicate that somewhat. We just talked about this one a little bit. I didn’t think it was as bad as some people did but it still seemed like a huge miss. I did love the visuals. The movie looks amazing. Definitely Keith. I think so many of us badly wanted a classic sci-fi like D9, but it didn’t happen from this. As long as we can separate it from that movie (which is hard to do with the same director and similar themes/structure) I think a majority realized this is a good, visually impressive, action fueled in spots sci-fi. Good review Jackson. A lot of people didn’t like this, but I thought it was fun and exciting for what it was. Even if it wasn’t nearly as subtle with what it was trying to say like District 9. Even if it is sort of heavy, it has somewhat of a pseudo-popcorn feel about halfway through in my opinion. Thanks Dan! I’ll be honest, I thought this really dropped the ball. A great premise let down by terrible dialogue and a really poor conclusion. Just my thoughts though! I can definitely get that. I too think that there are a few more questions than answers, the ending is kinda Hollywood but I’d be lying if I didn’t say I was entertained solidly throughout. I was the home crowd for this film. I love the concept and thought District 9 was a knockout. Sadly, I didn’t have as much fun with this as I’d hoped. I think it’s a ‘one way’ film. I can’t see myself coming back to it for repeated viewings to discover new layers, like I have done with District 9. That said, I think Blomkamp is a strong shooter. His ideas are to be applauded. I’m eager to see Chappie. Even if Elysium’s ideas don’t come together as flawlessly as D9’s, in this day and age his guts for telling what he wants is commended. You can tell he has a real love for the genre of sci-fi. At the very least the visuals are top-notch. I think you like sci-fi right? A watch is definitely needed Parlor, thanks for stopping by. I wasn’t totally crazy about this one. I loved District 9, and looking forward to Chappie. This just seemed bland at times. But visually it was fantastic. I am beyond excited on the news of this director working on a new Alien movie though! I do a lot of movie reviews as well, be sure to check out my blog if you get a moment! Great post, keep up the awesome work! Thanks for stopping by. I’ll have to give your site a look! Yeah man! Thanks for the follow!